Emory will recognize World AIDS Day this week with two campus events intended to draw attention to the worldwide fight against HIV, support people living with the virus, and honor those whose lives have been claimed by AIDS. The fact that the Quilt on the Quad is based at Emory is fitting, given the university’s longstanding role in the fight against HIV/AIDS, says Sydney Wolin. Emory College senior and president of Emory’s Quilt on the Quad. Since the earliest days of the epidemic, Emory physicians, scientists, nurses, public health workers, and educators have played a pivotal role in providing care, developing life-saving treatments, and raising awareness around prevention and transmission of the disease. From inventing some of the most successful drugs to battle the virus to developing and testing promising new vaccines, from conducting clinical drug trials and leading behavioral and prevention research to treating and counseling thousands of patients, Emory has long been recognized as a local, national and international leader. World AIDS Day this year is Saturday, Dec. 1, marking the 20th anniversary of an event widely considered to be the first global health day. And for more than a decade, Emory has marked the occasion with the annual Quilt on the Quad, the nation’s largest collegiate display of AIDS Memorial Quilt panels. This year, for the 15th anniversary of Quilt on the Quad, members of both Emory and the greater Atlanta communities are invited to visit more than 800 quilt panels, which will be on display on the Emory Quadrangle on Friday, Nov. 30 from 10 a.m. to 4 p.m. In the event of bad weather, the display will be held on the basketball courts at the Woodruff PE Center (WoodPEC) on Friday from 9 a.m. to noon. Viewing a campus landscape carpeted with the quilt panels is a powerful experience, says Sydney Wolin, an Emory College senior and president of Emory’s Quilt on the Quad, a nonprofit student organization dedicated to increasing campus awareness of HIV/AIDS. Each panel was handcrafted by friends and family, reflecting colorful, personal details that communicate careers, lives and interests of a loved one lost to AIDS. Preview panels have been on display in over a dozen visible locations around campus for the past week, she says. During this week’s display, a community fair featuring student-run organizations will be held from 11 a.m. to 2 p.m. During that time, Emory Hillel, the center for Jewish life on campus, encourages visitors to stop by and help make sandwiches for the Midtown Assistance Center (MAC), a local nonprofit that helps low-income individuals and families find resources, from food assistance to referrals for social services. Visitors may also participate in a raffle for a Starbuck’s gift card; proceeds will be donated to AIDS research, Sydney Wolin says. 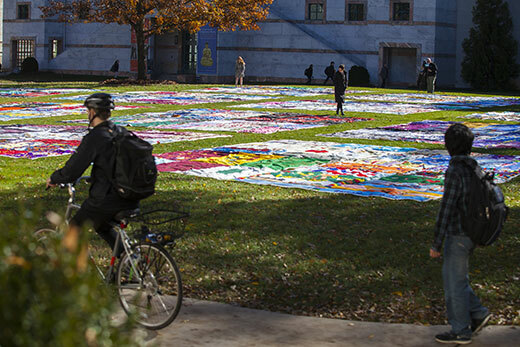 Over the past decade, the Quilt on the Quad project has helped unify and inspire the Emory community to help take action against AIDS and commemorate those who have lost their lives to the disease, notes Wolin. Today, more than 1.1 million people in the U.S. are living with HIV, however, one in seven of them don’t know it, according to the U.S. Centers for Disease Control. Across the U.S., rates of HIV and AIDS diagnoses remain highest in the South. To help increase awareness of World AIDS Day this year, Emory’s Office of Health Promotion will offer free and confidential rapid HIV testing for all Emory students, faculty and staff on Thursday, Nov. 29 from 10 a.m. to 4 p.m. at the WoodPEC. Members of the Emory community are also invited to pick up a red ribbon at the rapid HIV testing site at the WoodPEC to wear this Thursday, take a selfie, identify why knowing your HIV status is important to you, and share it on social media with the tag @emorylgbtlife and #KnowYourStatusEmory. The ribbons are being provided by the Office of Lesbian, Gay, Bisexual and Transgender Life.